ParisDailyPhoto: Hurrah, the sun showed up! Hard to believe, we saw a ray of sun today... It was even warm at lunch time! So warm that some people even ventured at Paris Plage. As I told you, our yearly beach opened 2 days ago, and like every year it breaks a couple of records: twice the amount of sand as last year, Sleeping beauty castle, giant deck chairs... and a lot of daily events. I'll show you more along the month of course. Is Paris Plage slowly becoming...Disneyworld?! ahh.. some sand along the Seine! how nice! 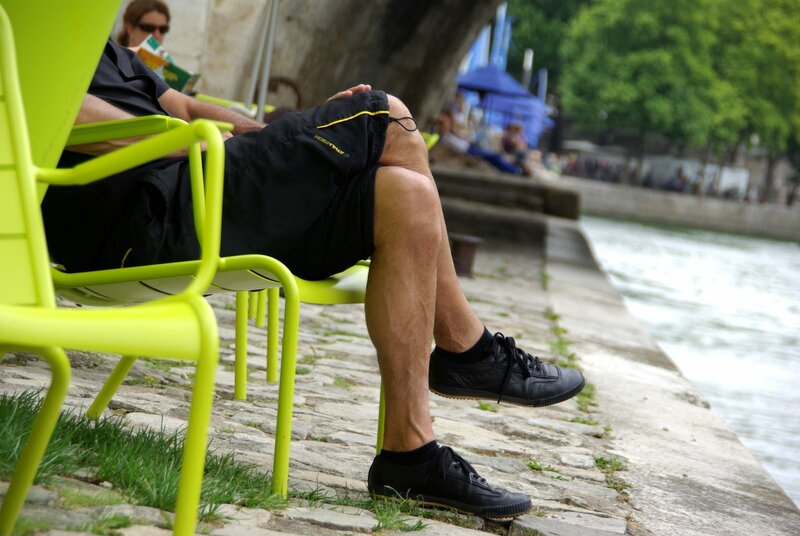 I love the acid green colour of these chairs! Or shall we say chartreuse?!?!? a shy ray of sun showed up yesterday and it is pouring rain right now and very strong. To be honest, I think of those of you who are suffering in the US the incredible heat and I'm almost happy with the rain, here! But I'll be happy when the sun will reappear too...! Those chairs are SO bright! Oooh, Sleeping Beauty castle? (Pretty please, a picture of that?) Enjoy your sun..it has been quite warm here in the States, but the beach has been wonderful this last week. Loving the fact that we have summer!